Last weekend, on October 9, 2010, The Rock Poster Society held its 10th annual Festival of Rock Posters at the Hall of Flowers in San Francisco’s Golden Gate Park. This is one of two events TRPS sponsors during the year, the second being a spring/summer show called Rock Art By the Bay. That show is for artists only and is free to the public. The fall show carries a modest admission charge and also includes dealers, which means there are lots of vintage Fillmore, Avalon, Grande, and Shrine material to ogle. 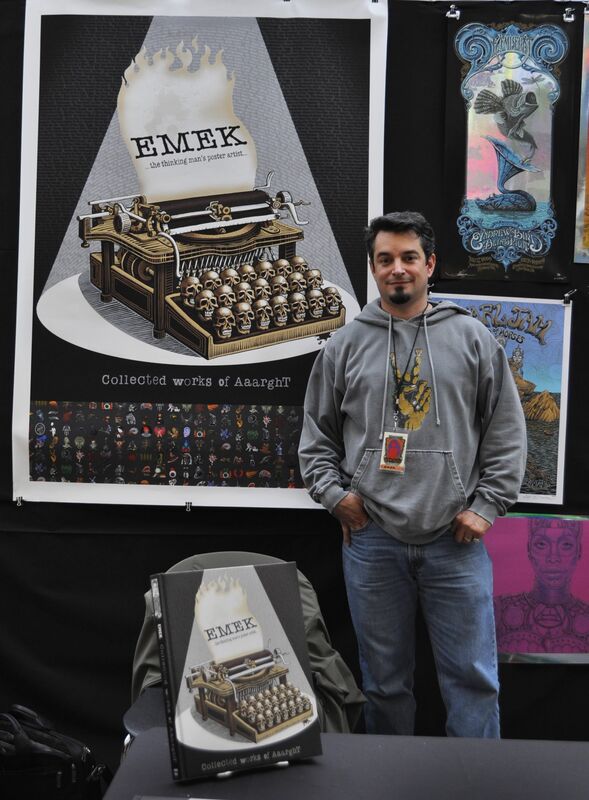 By the end of the show, even the poster advertising Emek's new book had sold. Also, each year an artist produces a poster for the fall show, the proceeds of which go to the TRPS Artists Relief Trust, which the organization uses to assist poster artists who may be going through a rough patch in their lives. This year, the great Chuck Sperry created a gorgeous show poster to support this ongoing effort. For the past couple of TRPS shows, I’ve been one of many volunteers who has worked the event. To be clear, there are many people in this all-volunteer organization who do far more that I do, and none of us can hold a candle to the people who make sure the artists get fed during the day. But when the show ends at 6 it’s a race against the clock to pack everything up, load the trucks, and get the place swept up by 8. This year we finished with 10 minutes to spare. In recent years, the rock star of the rock-poster show has been Emek, who was in town to debut his beautiful new book, “Collected Works of Aaarght.” For pretty much the entire day there was a steady stream of collectors who waited for Emek to sign and doodle their newly purchased books, as well as posters from their collections. Emek does this all day long—by the end of the afternoon, someone had even purchased the canvas poster advertising his book, which Emek dutifully signed and doodled. Victor Moscoso is one of the most respected artists from the San Francisco scene of the 1960s. If Emek represents the new guard, Victor Moscoso represents the old, which is not meant as a disparaging remark, it’s just a fact. 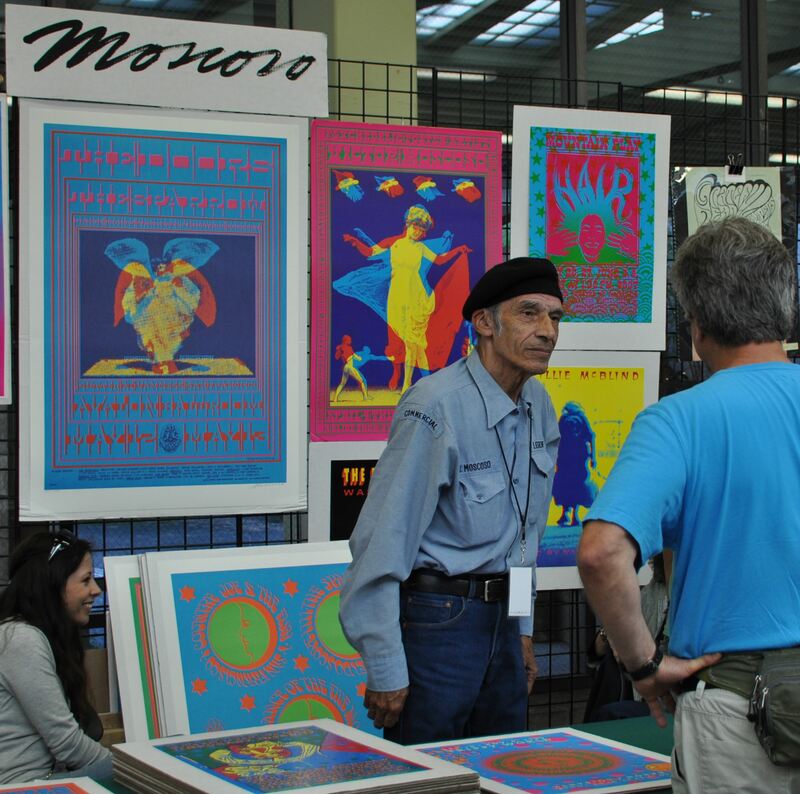 Moscoso, whose shirt actually features the word “legendary” right on it, produced some of the most iconic psychedelic posters from the San Francisco scene of the late 1960s. His secret was to break the rules of “good” graphic design by placing oppositional colors alongside one another. That’s not all he did, though: Moscoso was also a master at lettering and had a terrific sense of balance when it came to positioning blocks of potentially unbalanced text and images on a page. There was always a lot of order to a Moscoso poster, even if the colors were so trippy that you could barely focus on it. Gary Houston is another artist whose booth I look forward to visiting every year. Like many of the second and third generation poster artists who have followed Moscoso and his peers, Houston screen prints his posters. Typically, he starts by scratching out an image on a board called, as you might expect, scratch board. Because the boards he scratches are smaller than his posters, Houston must enlarge his source images. The result is a slightly scruffy but carefully composed poster, whose subjects range from portraits to abstracts that borrow their symbols from totem poles and Northwest coast native masks. To see more photos from the 2010 Festival of Rock Posters, visit my Show & Tell pages for Emek, Moscoso, Houston, Alexandra Fischer, and Ryan Kerrigan. “ ” She could wear it in her corset, where it would be a constant reminder of his love—probably because it was uncomfortable.